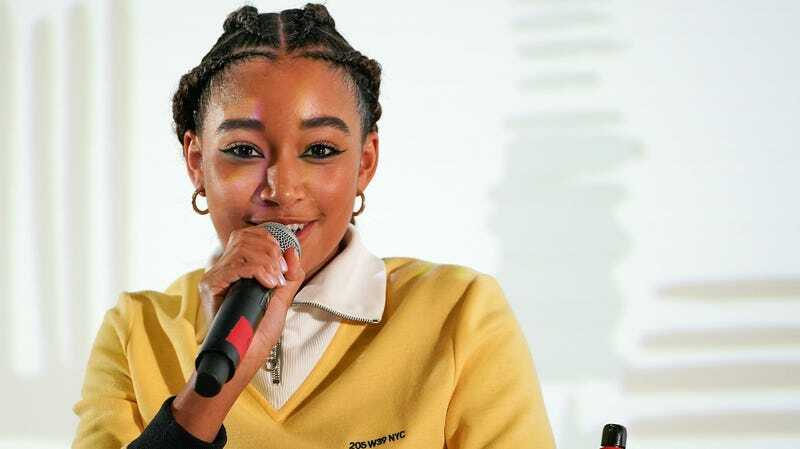 Amandla Stenberg speaks during the Q&A following the premiere of ‘The Hate U Give’ on Day 4 of the 2018 Urbanworld Film Festival at the AMC 42nd Street Theater on September 22, 2018, in New York City. Collaboration, innovation and the power of women—these were recurrent themes at the 2018 Urbanworld Film Festival, which brought unseen gems, highly-anticipated box office hits, and established and up-and-coming filmmakers and talents from all over the world together for five incredible days in New York City. The week, which opened with the Tiffany Haddish and Kevin Hart-led comedy Night School last Wednesday, also featured screenings of the celebrity-voiced animated film Smallfoot and climaxed with the slick crime heist thriller Widows, starring revered actress Viola Davis as we’ve never seen her before. Already having garnered significant acclaim at the Toronto International Film Festival, Widows features Davis as widow turned-criminal mastermind Veronica Rawlings, getting a long-deserved star turn in the Steve McQueen-directed and female-driven vehicle. The film, which is at equal turns dark drama and dynamic action flick, follows Davis as her character recruits and leads a band of fellow widows in picking up where their robber husbands left off after being killed during a heist. Faves Brian Tyree Smith, Daniel Kaluuya, Liam Neeson, Michelle Rodriguez and more are all in the ensemble cast, but it’s really Davis’ movie, and it’s startling to consider that despite her ridiculously high profile, this is the role she hopes will convince Hollywood of what we already know: that she can carry a film. But by far, the most anticipated event of the week was the closing night screening of The Hate U Give, which was attended by two of the film’s young stars, Amandla Stenberg and Algee Smith, director George Tillman, Jr., and a special appearance by fellow director and Urbanworld alum (and former festival publicist) Ava DuVernay in an after-screening talkback. The film, adapted from Angie Thomas’ bestselling young adult novel of the same name, is ultimately much more than a coming-of-age story. The film, which catapults the audience through a full range of emotions and occasionally veers into “after-school special” territory, is nevertheless gripping, as it touches on our common struggles, fears, commitments, current national nightmares and hopes for the future. While the journey is, at times, stressful, it’s ultimately a must-see film with an incredible cast that includes standout performances from Stenberg, Regina Hall, Anthony Mackie and a stellar Russell Hornsby. (L-R) Algee Smith, Amandla Stenberg, director George Tillman Jr. and filmmaker/producer Ava DuVernay pose for a photo following the premiere of ‘The Hate U Give’ on Day 4 of the 2018 Urbanworld Film Festival on Sept. 22, 2018 in New York City. But at its heart, Urbanworld is for the up-and-comers, and there were no shortage of them at this year’s festival. Aside from the eight spotlighted screenings this year, which included the above films as well as already-acclaimed independent offerings like United Skates, Little Woods and a 30th anniversary return to the big screen of Coming to America, there were over 70 full-length features, documentaries, narrative and animated shorts, web originals, music videos and content from young creators from around the world considered by the Urbanworld juries this year. A few of the big winners you can look forward to seeing on the screen soon? The full-length feature Pimp, starring a transformed Keke Palmer as a young female pimp in a story by women, about women, grappling with issues of survival, family and love. The film took home both the Narrative Feature and the Audience Award for Narrative Feature—and is one to watch for, as it secured a distribution deal during the festival. Also making waves is Documentary winner Mr. Soul, which made a major splash at its Tribeca Film Festival premiere this year, and is continuing to garner buzz as it makes the festival rounds. It’s the story of the East Coast-based ’70s black variety show Soul!, hosted by Ellis Haizlip, revisited and brought to vibrant new life by his niece, director Melissa Haizlip, and a host of famous faces. But while women-driven and -centric stories, global perspectives and new media platforms were all major themes of this year’s Urbanworld—which was notably staffed and seemingly attended primarily by women—collaboration was truly the message. At the awards brunch, presenter (and eternal heartthrob) Boris Kodjoe took a moment to urge attendees to look around at fellow creatives and change-makers—even representatives from corporate sponsors HBO, AT&T, BET and upcoming streaming network Reign. He asked everyone to consider the culture that Urbanworld had helped make possible. Kodjoe then urged the crowd to meet and exchange information with each other before putting the festival to bed for another year. And as soon as the last award was handed out, that’s exactly what happened: Creatives of color, shaking hands, rubbing shoulders, exchanging hugs and praise, and celebrating this coming together to express our visions of the world, on our terms. And for those who attend, whether simply to watch or ultimately, to win, that is what Urbanworld is and has always been about. It’s the core of its ethos, and one suspects the key to its longevity. If there was a complaint to be made, it’s simply that there’s not possibly enough time to see all the potential it offers.